Dino Melaye, lawmaker representing Kogi west senatorial district, has been arrested at Nnamdi Azikiwe International Airport in Abuja. The lawmaker tweeted this on Monday morning. Melaye said he was on his way to Morocco for an official assignment when the police arrested him. When contacted, Anjuguri Manzah, spokesman of the police in the federal capital territory (FCT), said he was not aware of the arrest. 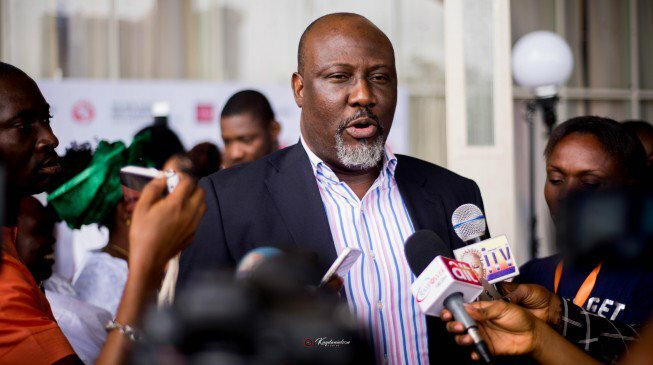 “I cannot confirm what you are asking because I am not aware of Dino Melaye’s arrest,” he told TheCable. The police had declared Melaye wanted in connection with a murder case. Some suspects had allegedly implicated the lawmaker. He was accused of supplying arms to them. Last month, the federal government him to court for allegedly framing Edward Onoja, chief of staff of Yahaya Bello, governor of Kogi state. Melaye had accused Onoja of being behind an alleged assassination attempt on his life in April 2017. But in a suit filed by the office of the attorney-general of the federation (AGF), the federal government said the police found out that Melaye’s claim was false. The suit was filed before a high court of the FCT. Melaye was also accused of making a false statement of facts in a phone conversation with Mohammed Abubakar, son of the late Abubakar Audu, former governor of Kogi, with the intention of harming the reputation of Bello’s chief of staff.